Before you start shopping around it is important you know your priorities. For example, are color and design the most important features in your new windows? Are you looking for better energy savings? Is durability and weather resistance important? All of these factor into the price of your new windows. And any extra options you choose on your windows will add up fast. If you know your priorities, you will know which extra options are worth your money and which ones you don’t need. What Materials are Best for Your Home and Budget? The frame material of new windows largely affects the price. Wood and fiberglass windows are often the most expensive. Vinyl and aluminum windows are usually more affordable. But before making a decision on window materials you want to understand the unique advantages and disadvantages of each one. Which ones offer the best insulation? Which ones require less maintenance? Which ones will last the longest? In order to stay on budget, you want to make sure you are choosing window materials that offer the best value. What Window Styles are Most Affordable? When it comes to choosing a window style it might be best to stick with the basics. Common styles are generally the most affordable. 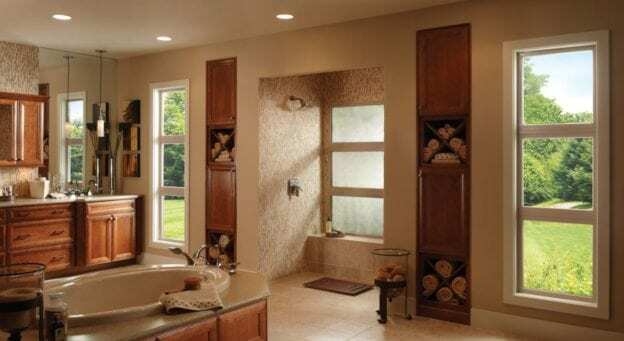 So consider picture, sliding, and single hung, and double hung windows. If you choose more unique sizes, shapes, and styles then you will end up paying a lot more. To avoid overspending some of the best advice we can give you is to get an estimate from three reliable companies. Many homeowners are hesitant to negotiate, but most companies will offer price matching or other incentives. That said, you shouldn’t just choose the company that offers the lowest prices. Remember, if the cost is too good to be true, it probably is. Reliable window companies will offer similar pricing on projects in the same work scope. Who is the Best Contractor for the Job? You can choose the right material and window style, but it will all be for naught if you don’t have an installer you can trust to get the job done right. You want a window contractor that is professional, reliable, efficient and adheres to quality standards. This will help you avoid the cost of lesser-quality work, poor installation, or a lack of warranty coverage. To get the best prices on window replacement in Ahwatukee, AZ contact Freelite Inc. We offer customers a no-hassle, no-pressure way to buy. Contact us at (602) 233-1981. Or visit our showroom at 331 W. McDowell Rd., Phoenix, AZ 85003. This entry was posted in Freelite Blog on April 1, 2019 by Freelite Blog.